Description: The Button Sandals feature not only button knots, but they also have regular buttons for decoration. 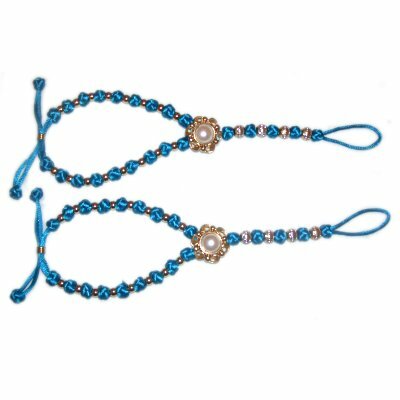 The closure for these Barefoot Sandals is a sliding bead clasp, making the design adjustable. 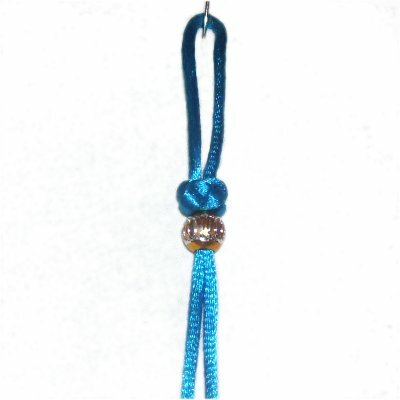 By using Satin Cord, as in the example, along with high quality beads, you end up with very elegant Foot Jewelry. When using Satin, make sure you do not push pins through the material, since it's fragile. Lean the pins over the cords, or use the Cross-Pin technique. 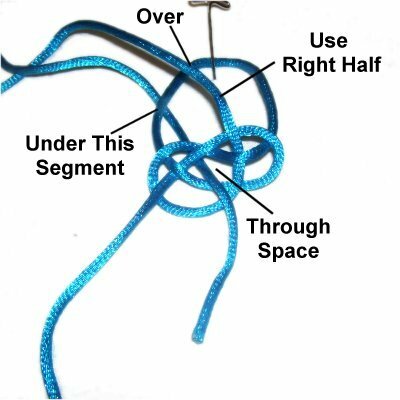 The best knot for this design is the Knife Knot, also called the Diamond knot. It's the easiest to tighten and place in the right position. But you can also use the Sliding Celtic Button if you wish. 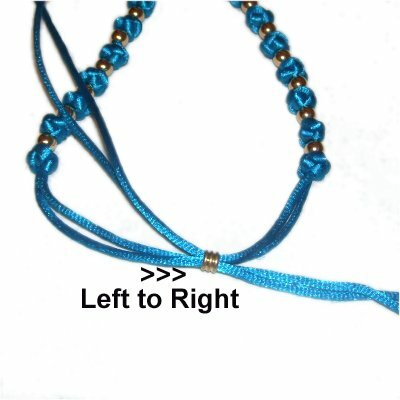 This Micro-Macrame design is rated moderate, since button knots in general are a challenge. The overall design is very simple, since only 2 knots are used in construction. Make sure you practice the knot prior to attempting this design. 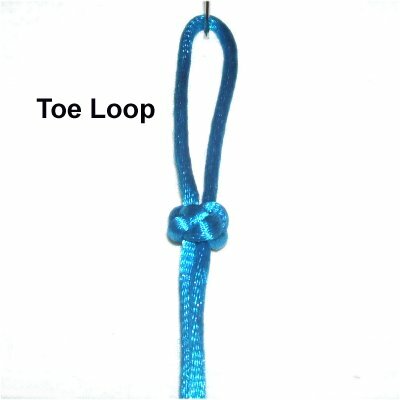 Toe Loop: Measure around the second toe and add 1-inch. 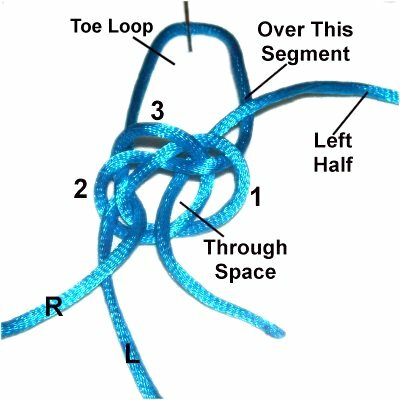 The first knot should rest past the toe crease. Center Piece: Measure from the toe crease to the place you want the straps to branch off, which is where the button will rest. Ankle Straps: Measure from the button area to the back of the ankle. Preparation, continued: Add the results of all three measurements to get the total length of your Button Sandals. Multiply the total length by 10, and cut one cord to that size. Cut a second cord 18 inches shorter than the first, unless you prefer to cut both the same size. Prepare the ends with glue to prevent unraveling and to stiffen the material for beading. You can also use the lighter to melt the tips slightly, if using nylon. Step 1: Fold the longest cord in half and secure it to your board at the center. 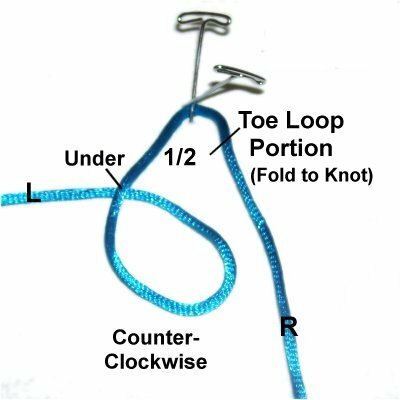 Divide your toe loop measurement in half and move down that distance from the center. Make a counter-clockwise loop with the left half of the cord, passing under at the crossing point. Step 2: Curve the right half of the cord to the left, so it rests partially under loop 1. It should pass over the left half of the cord in the area just above loop 1. Step 3: Move the right half of the cord under the left half, as you bring it to the right. Secure the first loop by leaning a pin over the cord in that area. Step 4: Pass the right half of the cord through loop 1, over - under - over - over the four segments. This creates loop 2 on the left. 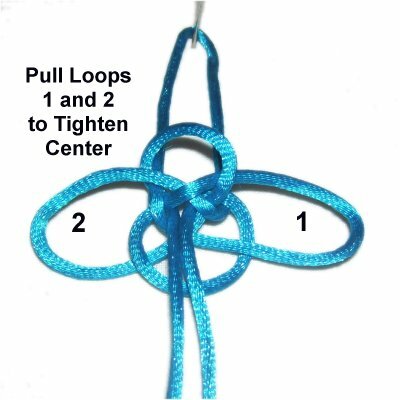 Step 5: Tilt loops 1 and 2 towards you, so the knot is standing upright. The toe loop should be flat on the board. Tighten the knot slightly and balance it, so you can clearly see the space in the center. 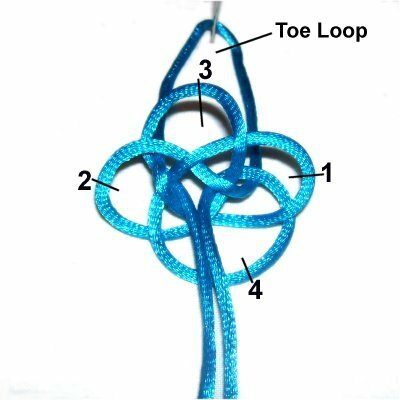 Step 6: To create loop 3, move the right half of the cord to the left side of the knot, over the toe loop portion (behind loops 1 - 2). 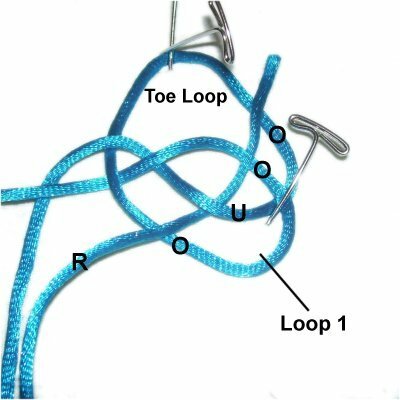 Pass it under the left segment of the toe loop, moving down closer to the two loops. Move it through the space in the center, pulling it towards you (back to front). Design Tip: All four loop should be large enough to see clearly, and about the same size. Step 7: To start loop 4, move the left half of the cord under the right half, as you move it to the right. Step 8: To complete loop 4, rotate the left half of the cord in a counter-clockwise direction. Pass it over the right segment of the toe loop, and through the space in the center (back to front). It should rest to the right of the other half of the cord. Important: The appearance of your Button Sandals depends on how neatly the knots are tightened. Pay close attention to the following steps, which show the most effective way to tighten the Knife knots. Step 9: Mentally number the four loops as shown, which is the order they were made. Make sure they are standing upright, with the toe loop flat on the board. 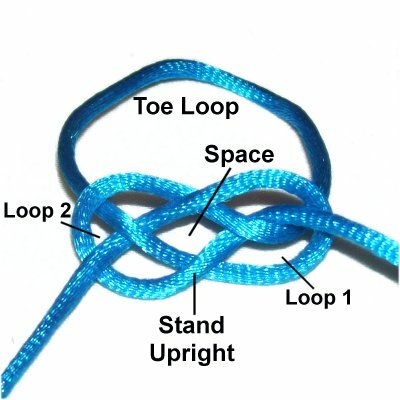 Step 10: Pull loops 1 and 2 horizontally, which will tighten the center of the knot. This will also tighten loops 3 and 4, which is OK as long as you can still see them. 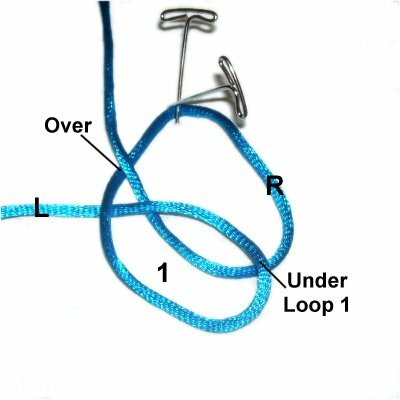 Step 11: Pull on loops 3 and 4 vertically, to tighten loops 1 and 2. 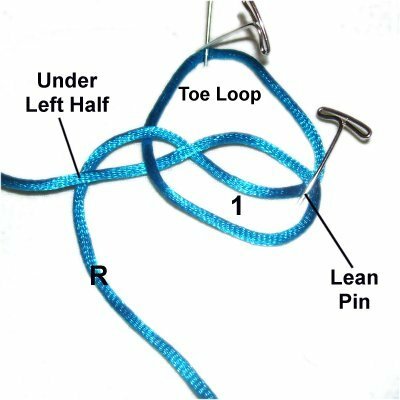 Put the toe loop on your foot to see if the knot is in the right place. 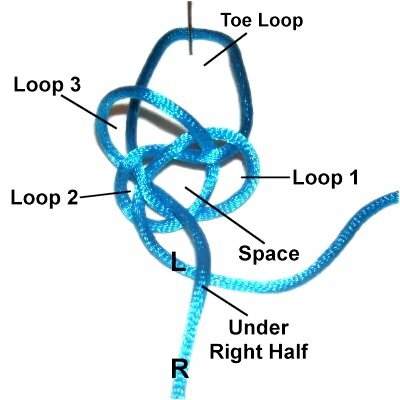 Loosen the knot if changes are needed, by pulling on the four loops. 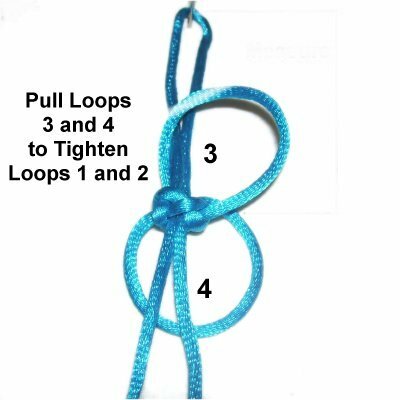 Step 12: Once the knot is where you want it, pull the two halves of the cord to tighten loops 3 and 4. 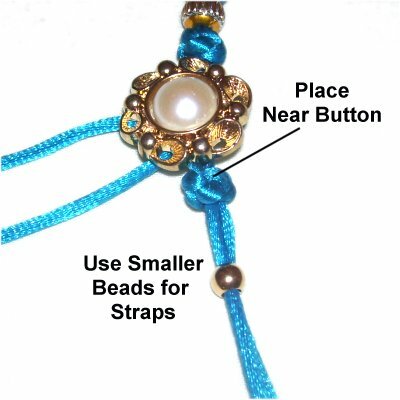 The center piece for your Button Sandals is a combination of the same knot you just tied with beads. This is the portion that fits along the top of the foot. The final step is to add the button. Do not rely only on the measurements you got in preparation. 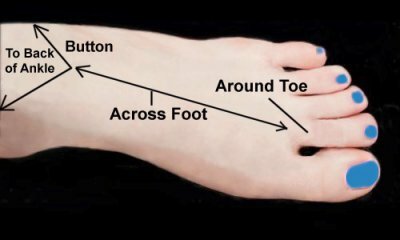 You should put the sandals on your foot to determine the size of this area. Step 13: Add one 8mm bead. 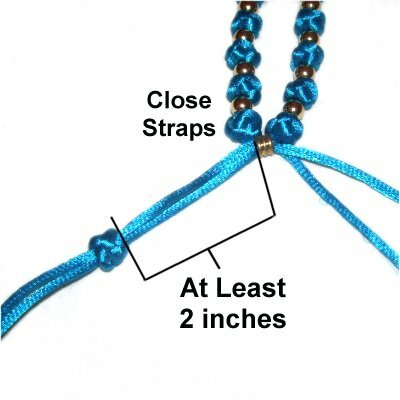 Make sure the bead slides easily, since Satin Cord can be damaged if the beads are too tight. Step 14: Repeat steps 1 - 12 to tie the next Knife knot. 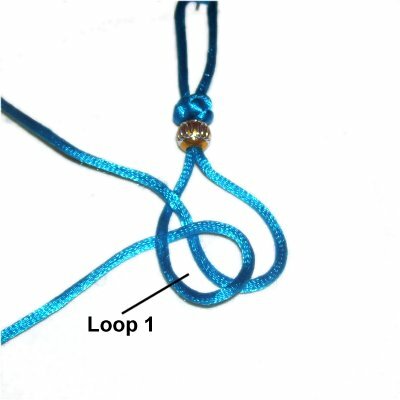 When you tighten loops 1 and 2 (step 11), make sure the knot rests against the bead. Then tighten loops 3 and 4. Step 15: Repeat step 13 and 14 several times, until the center piece for your Button Sandals is the size you want. Keep in mind you still need to add the button, if you wish to do so. That will add another inch to the length of the center piece. Step 16: Turn over the center piece, so the front of it is touching the board. Pass both halves of the cord through the shank of the button (shank face up). The top edge of the button should rest against the last Knife knot you tied. 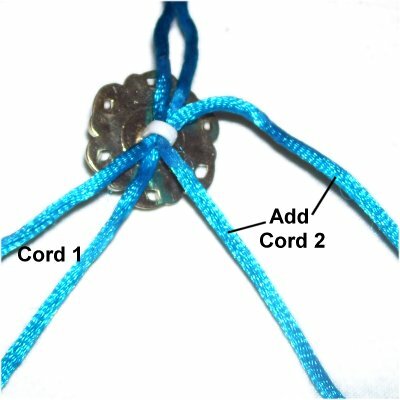 Step 17: Add the second cord by sliding it through the shank, placing it to the right of the other cord. The left half of the first cord is followed by the left half of the new cord. Then it's the right half of the first cord, followed by the right half of the new cord. 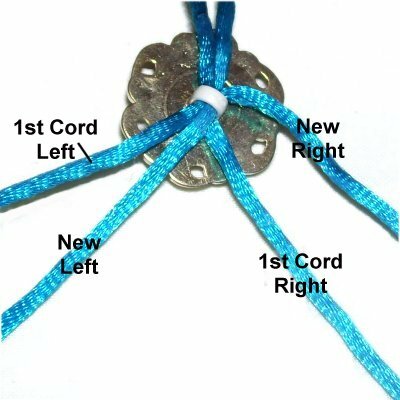 Step 19: Use the right half of the new cord along with the left half of the first cord to tie the first half of a Square Knot. The other two cords are the fillers. Before tightening, apply a SMALL amount of glue next to the shank. Make sure the button is in the right position, then tighten the knot firmly. Turn over the Button Sandals, so the button is face up. 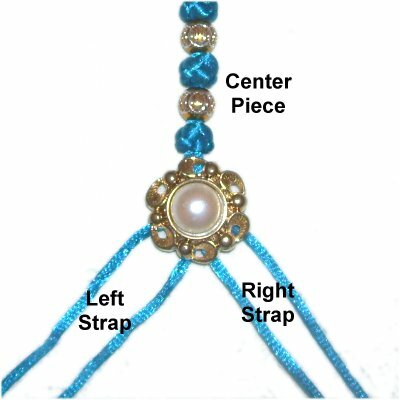 Step 20: The straps for your Button Sandals are similar to the center piece, but you should use the smaller beads (6mm). The first Knife knot should rest as close to the button as you can get it, without resting underneath it. Step 20, continued: Alternate the beads and knots until the you reach the strap measurement you got in Preparation. Put the sandal on your foot to make sure the strap is the right size. 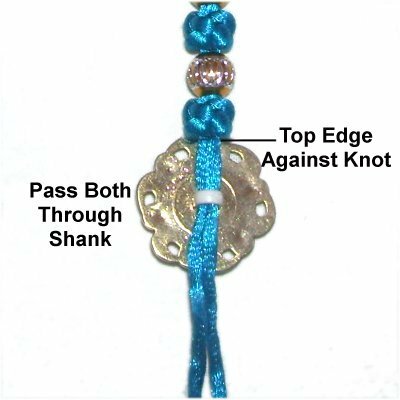 The last knot should rest in the back of your ankle, keeping in mind that there will be a bead for the clasp. Repeat the same process to create the second strap. Step 21: Pass the ends coming from the right strap though the bead for the clasp, from right to left. Pass the ends coming from the left strap through the bead, heading left to right. 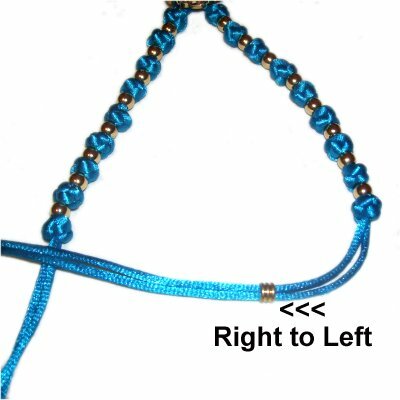 Make sure the bead slides easily as you pull on the ends. It still needs to grip the material or the Button Sandals will open too easily. Change to a different bead if necessary. Step 22: Pull on the ends to close the straps. Move down at least 2 inches, and tie a Knife knot with one pair of cords. Do the same with the other two cords, placing the knot in the same place (compare them). 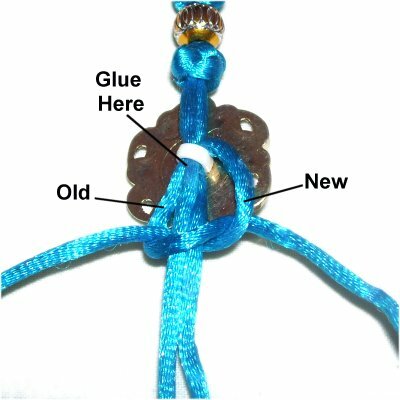 Step 22, continued: Apply a small amount of glue between the two ends where they exit the knots. Allow it to dry, then cut off the ends close to the knot. For nylon material, you can melt the tips with a lighter. Step 23: Repeat Preparation and Steps 1 - 22 to make the second Button Sandal. Have any comments about the Button Sandals? Contact Me.